More planning and consideration may go into building an outdoor deck than, say, an indoor bathroom. Besides determining it's a deck you want instead of a patio, you will need to establish a budget, select material, find a space to build it, and determine whether it is a DIY project or you'll need to hire a professional. This list includes 10 considerations before planning and starting to build a deck. Q: Why Do You Want a Deck? Is a deck the answer to extending your indoor living space, pushing it outside? Do you live in a climate that is warm several months out of the year? *If you have a view that's a pleasant one—preferably scenic—this might be where you would want to build a deck. A deck is a nice addition to a house; a deck with a view is even better. Extras: built-in seating, flowerboxes, railings, etc. Choice of lumber and cost. Get creative: One solution might be to add a small deck next to a patio made of concrete, brick or loose materials, which would cut down on costs but still give the look of and function as a deck. Do You Have the DIY Skills? If it's a basic, freestanding platform deck, you might be able to pull if off in a few weekends, depending on how much gusto you put into the project. Decks require a certain amount of carpentry, engineering, and do-it-yourself experience. Can you work a circular saw? Do you know what a circular saw is? Did you ever take a "shop" class? Is your dream deck going to be positioned on questionable ground—like sand, over water, in mud or clay, or unstable soil? Will it be a high- or multi-level deck that might require special engineering? Are you experienced working with concrete? If you have doubts as to whether your DIY skills are up to it, investigate further. You may need to hire a contractor or subcontractor. 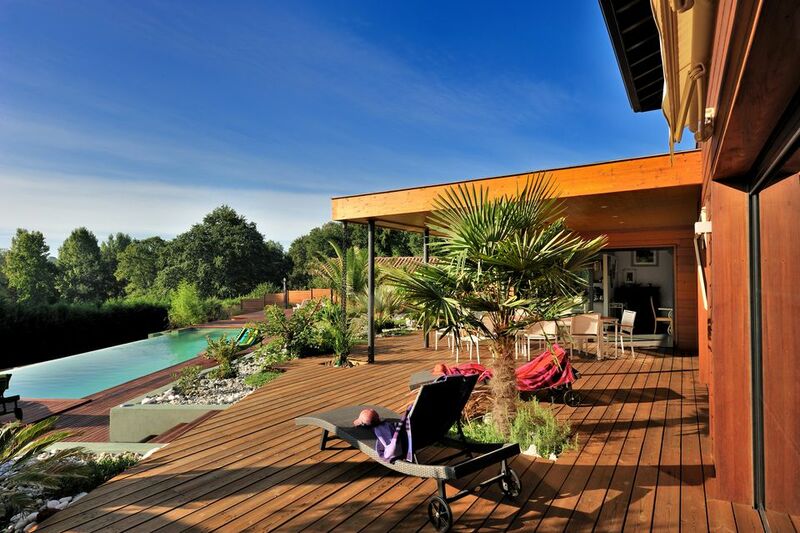 Although it's historically the original and most popular choice, wood is not the only decking material available. So, what is available? Weather-Resistant Woods, like redwood, cedar, cypress and the increasingly popular ipe. Pressure-Treated Woods, Treated lumber, which contains wood and preservatives. Hardwoods, like teak, ipe and Brazilian hardwoods. Composite Decking, which is made of recycled plastic and wood fiber. Alternatives, like plastic and aluminum, which both use recycled products. Size will be driven by your deck's location and your budget. Small space, small deck. Small budget, possibly a small deck. Big space—you get it. The shape of your deck may be dictated by the design of your house. Imposing a round, curving deck with carved railings onto a linear Midcentury Modern house might be forcing it into something it's not, or simply looks horribly out of place. Follow the lines, proportions and architecture of your house, so it's a natural extension; a seamless transition from indoors to out. Complement rather compete with a home's architecture. Coordinate with the surrounding landscape design. Simple platform decks are the easiest to build and have a clean, classic appeal. But you may not get off so easy. If the deck is higher than a few feet off the ground, railings for safety will be needed. So what if the deck is in a convenient location, but is hot most of the day? A roof of some kind will need to be built so that you can spend time on your deck in comfort. Another "what if": the deck is visible to your neighbors, and their yard is visible while on your own deck. Some sort of privacy screening will help block the view from either vantage point. In order for the project to be legal, the blueprints have to be approved by your city or county. Laws vary from city-to-city, state-to-state and so on—check on your city or county website for information about building permits, codes and other legal requirements related to adding or remodeling a residential structure. And do this homework before you buy materials or get too deeply into a potential deck project. If you're going to use your deck—especially in the evening—you'll need strategically placed lighting. Besides giving the deck a certain ambiance, it's an issue of safety. Knowing where you need it, the type of fixtures, and how much lighting you will need for your deck affects the design and budget. Solar lights may not be bright enough, and LED lighting still needs to be wired. If you don't have the DIY skills, an electrician will need to wire and install your outdoor lighting. Built-in storage is a natural—if you're going so far as to build a deck, you might as well at least consider storage. These come in the form of water-tight closets, lift-top benches and storage closets or shelving underneath decks built on a slope or second level. So, just what will you need to store? A built-in bench is practical and can serve as a railing. Using the same wood as the decking gives it a rich, customized look. Likewise, planter boxes constructed of the same lumber will soften or personalize a deck. It can also join it with the garden, or if there's no landscaping, can serve as a spot for your container garden.